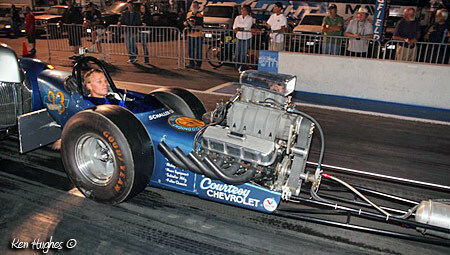 The Courtesy Chevrolet AA/GD is quite significant in drag racing history since it was powered by THE first blown big block Chevy ever made. 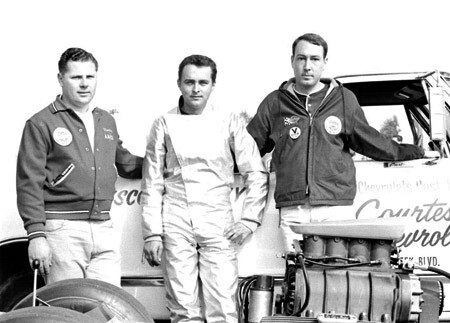 Partners in the car, Gary Goodnight, Bob Keith and Maurice Williamson, gained sponsorship from Courtesy Chevrolet in San Jose in 1965. 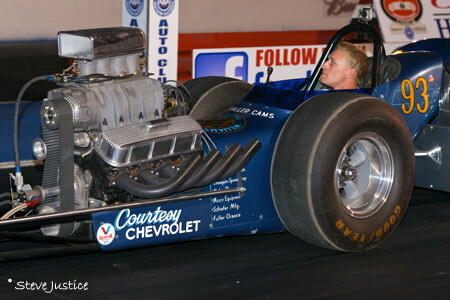 Courtesy owner Bob Hamilton wanted a Chev product between the frame rails, not the 392 Chrysler hemi the team then used. 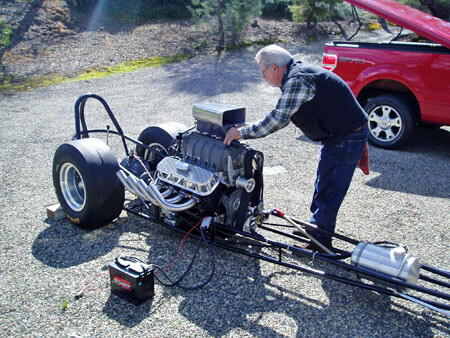 When it was explained to him that a small block Chev could not match the power of a Chrysler hemi and that there were no aftermarket parts for the just-released Chevrolet 396 big block engine, Hamilton opened his check book and said, "have them made". 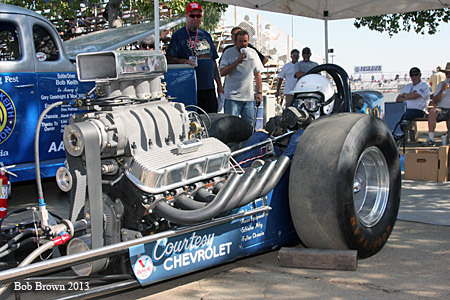 The team then approached manufacturers such as Mickey Thompson, Cragar and Joe Mondello to have the necessary parts made to fit a 6/71 supercharger to the big block. 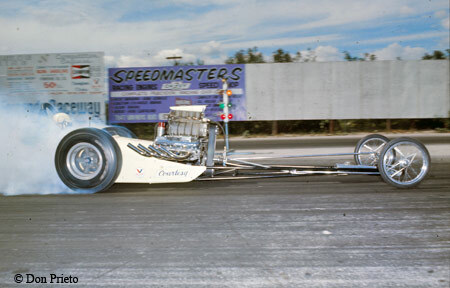 The car in 1965 with the hemi installed as it appeared when it went on the U.S. 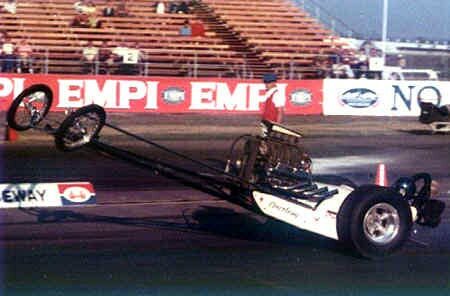 Drag Racing Team tour to England that year. 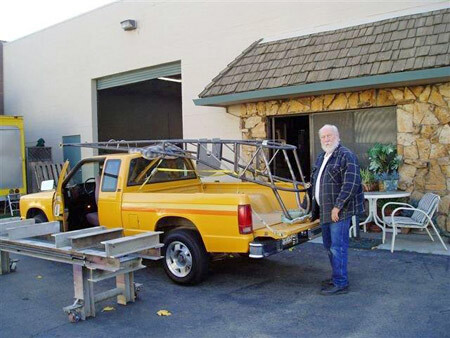 Location is outside the Schaller Cams shop in San Jose. 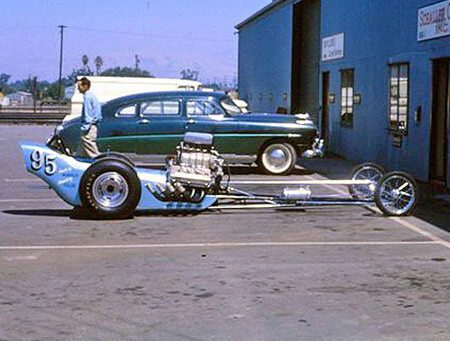 The team's breadloaf trailer that hauled the dragster all over the US in the 1960s. Bob Keith & Gary Goodnight. 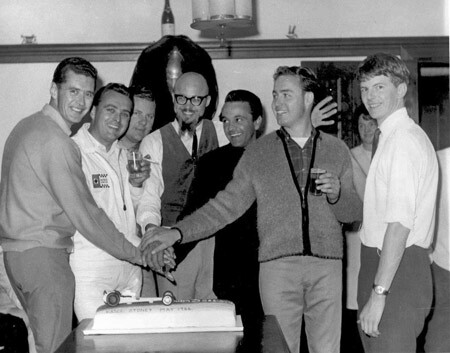 Maurice Williamson, George Schreiber, Tony Nancy, Ron Colson, an unknown Australian. 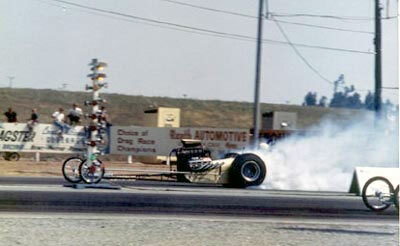 rear-engined car is in the background. 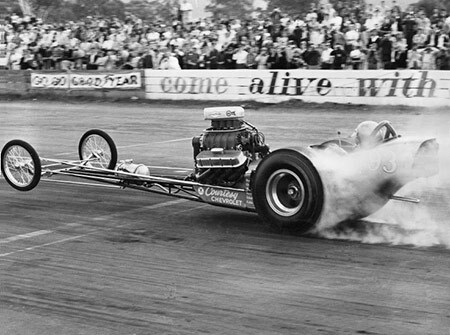 "Jet Car Bob" Smith in the Courtesy Chevrolet AA/GD. 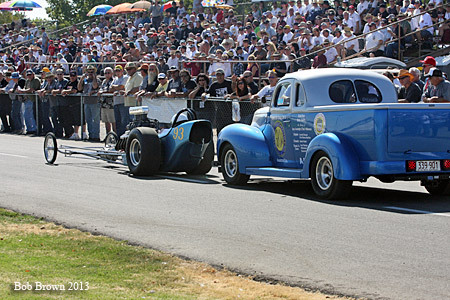 The Hagemann body, paint, and Drake upholstery are original. 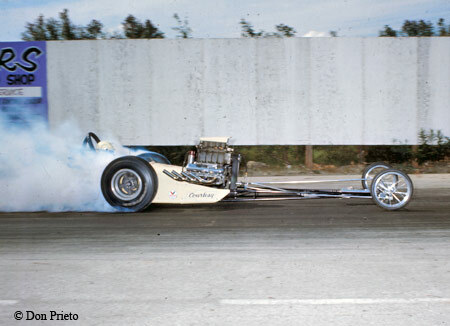 Chassis-building icon Kent Fuller constructed the original chassis, which could not be found for the restoration, so he built the frame again with the assistance of plans that were unearthed for the Masters & Richter Top Fueler, another of his cars that had the same dimensions as the Goodnight, Keith & Williamson AA/GD. 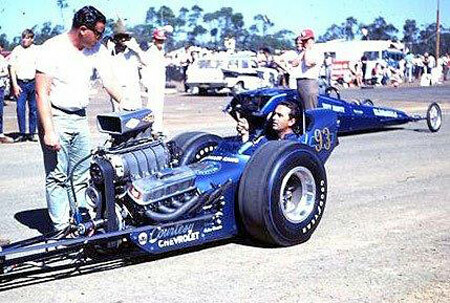 Arnold Chaves of Dos Palmas Machine was the original engine builder in 1966 and also handled the remake of this present engine. 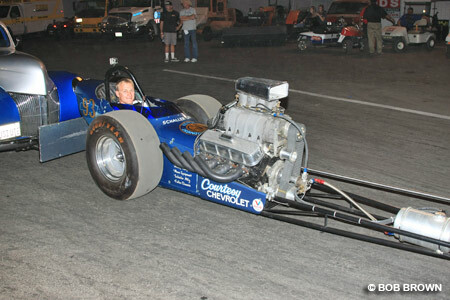 Gil Rothweiler, crew chief for the CHRR weekend had a hand in helping to build the original car. 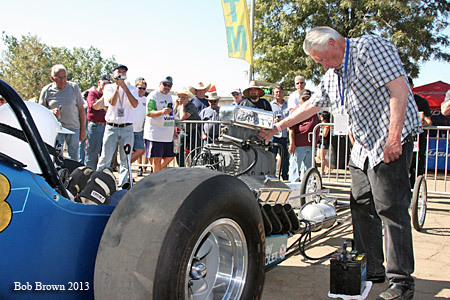 He worked for Schaller Cams in San Jose in the 1960s, and ground the cam for the original car. 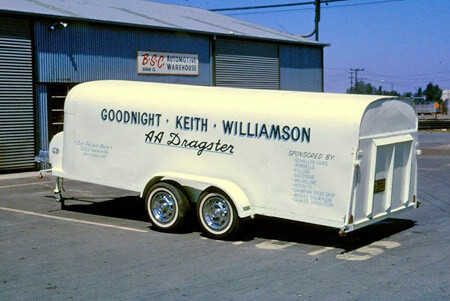 Bob Keith is the lone surviving member of the Goodnight-Keith & Williamson racing team (the other partners being Gary Goodnight and Maurice Williamson). 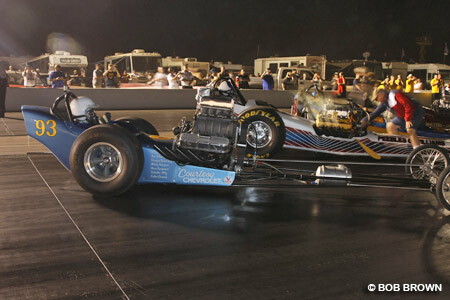 Unfortunately, he was unable to attend the CHRR for the car's debut due to health reasons. 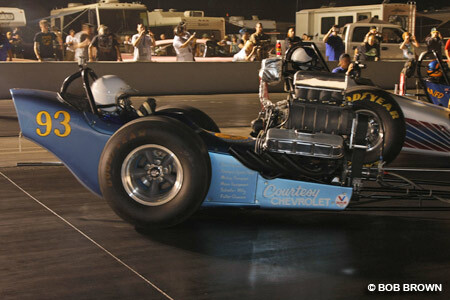 The rebuild of the car was financed by Australian drag racing journalist Lex Swayn who is the present owner and was with the car at the CHRR. 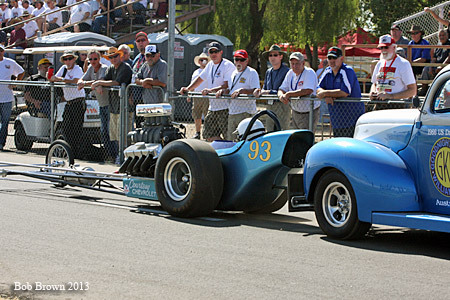 A 1940 Australian Ford Ute, owned by Tim Love of Los Angeles, did the push truck duties over the weekend. 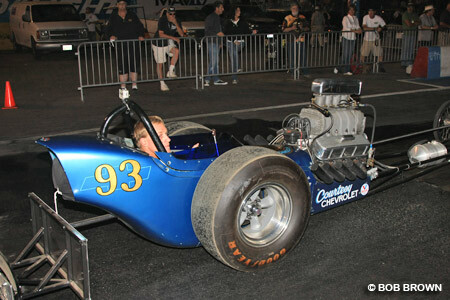 Terre Rothweiler, Bay Area sprint car driver and grandson of Gil Rothweiler drove the car in the Cacklefest activities. 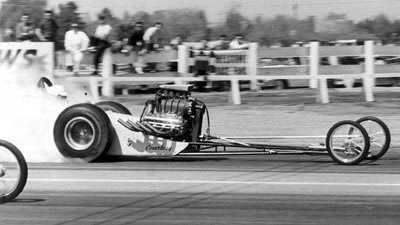 Bob Keith normally drove the car, but Jet Car Bob Smith was asked to step into the seat for a period of time while Keith recovered from a back problem. 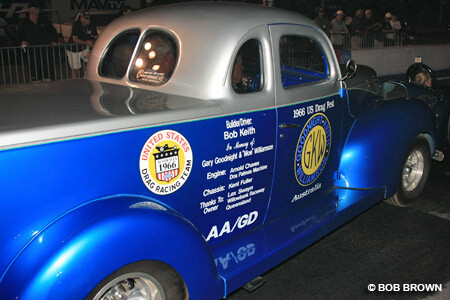 The original car was on the U.S. 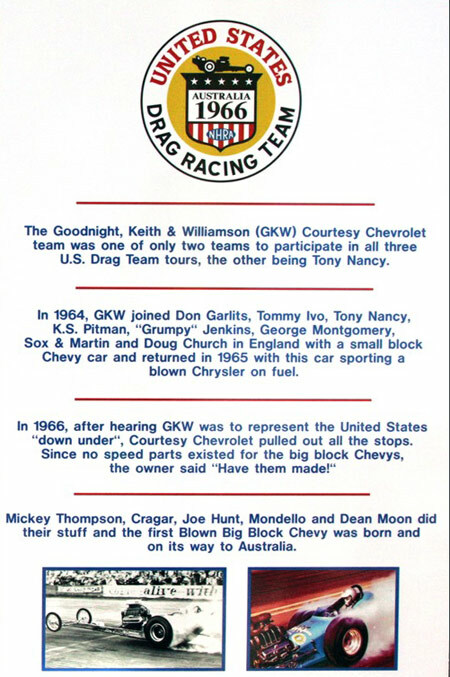 Drag Racing Team that went to England in 1965 (Chrysler powered), and then to Australia in 1966 with the newly fitted Big Block Chevy. 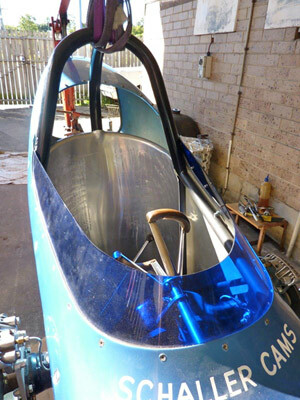 When the car returned to the US after the Australian tour, the team removed the body to make way for a much lighter magnesium body. 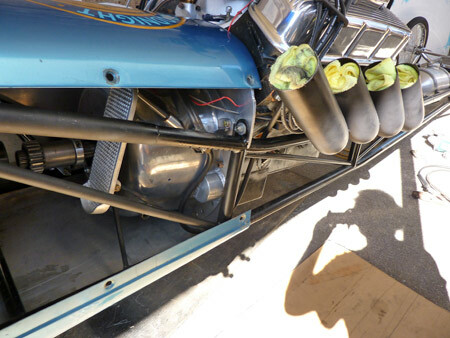 In 2006, when Lex Swayn interviewed Bob Keith for the 40th anniversary of that 1966 tour, he discovered that the original body had been kept by Keith and that it remained exactly as it had been when removed from the chassis in 1966. 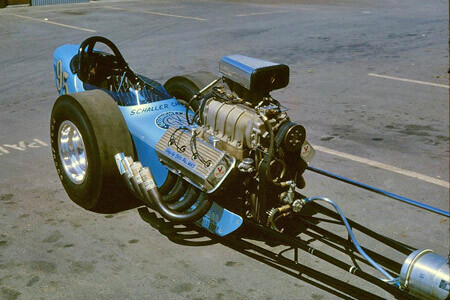 The body was shipped to Australia with the intention of having the chassis and motor built there, but when the opportunity arose to have the original US craftsmen redo their work, this was done in California by Kent Fuller and Arnold Chaves. 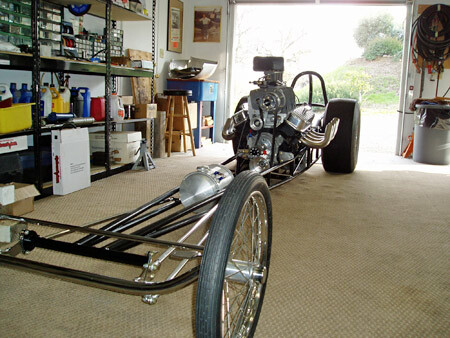 The car was then sent to Australia and mated with the original body in 2011. 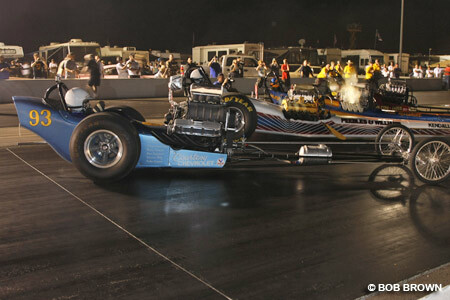 Swayn returned the car to the US last April, so that it could be seen and appreciated by a wider audience of fans in America. 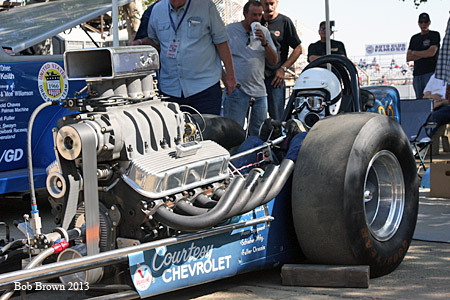 It is quite a piece of Golden Era drag racing history in Australia, as well as the US. 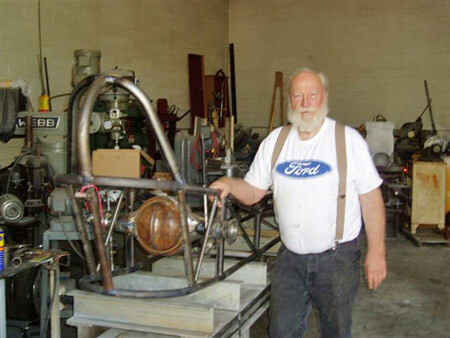 Kent Fuller with the chassis outside his workshop in 2009. 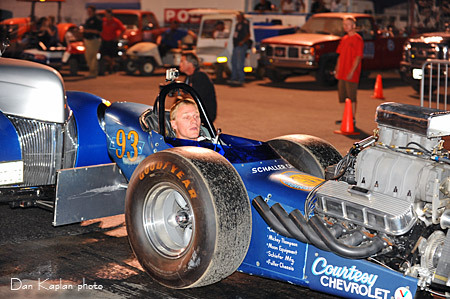 Kent Fuller working on the chassis in 2009. 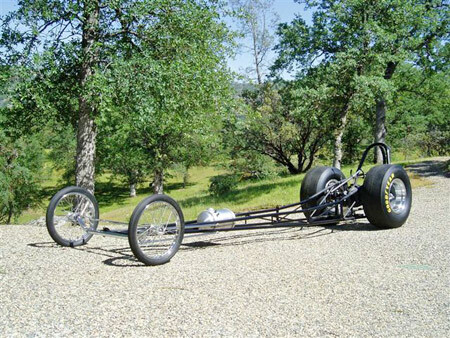 The rolling chassis arrived at Bob Keith's home in June, 2010. 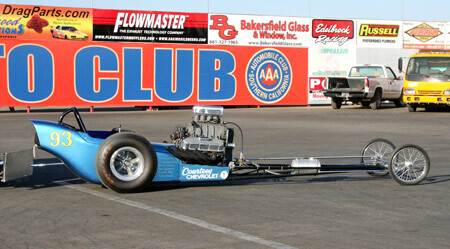 The Arnold Chaves-built motor was fitted to the chassis in 2011. 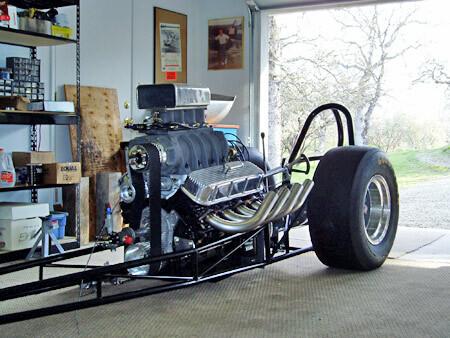 It is pictured here in Bob Keith's garage. 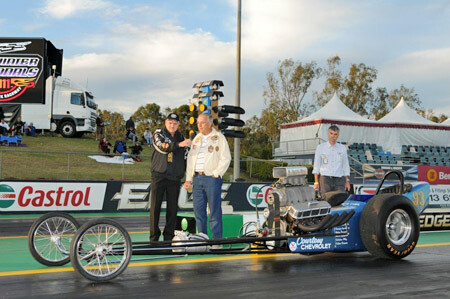 Bob Keith taken at Willowbank Raceway in Queensland, Australia in 2011. 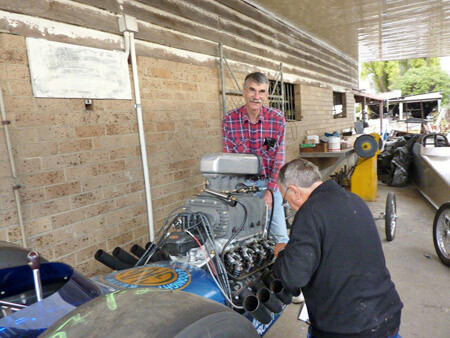 Australian chassis builder Bill Jones in Australia in May 2011. Fitting the seat at Weldwell in May 2011. 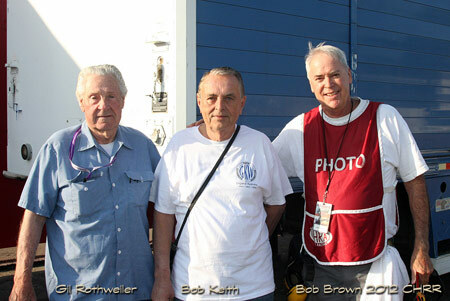 Willowbank Raceway track announcer Paul Casos interviews Bob Keith and Lex Swayn on the start line of Willowbank Raceway, near Brisbane, Australia, at the June, 2011 Winternationals. 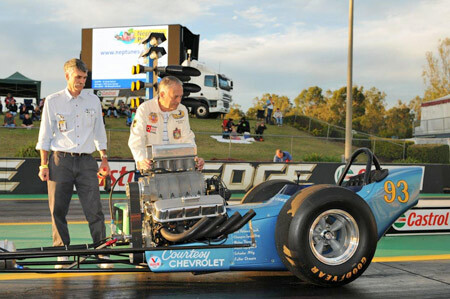 Bob Keith and Lex Swayn fire up the Courtesy Chevrolet Special for the first time in 45 years on an Australian drag strip on the start line of Willowbank Raceway, near Brisbane, Australia, at the June, 2011 Winternationals. 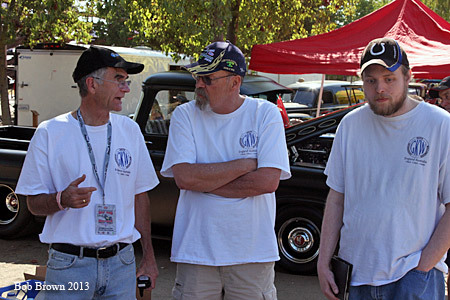 Gil Rothweiler, Bob Keith and Bob Brown at one of those impromptu meetups that occured at the CHRR. 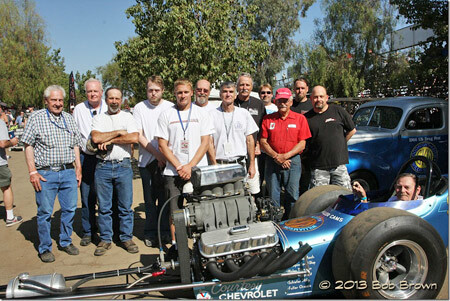 Here are some of the main characters with the car who were at the CHRR. 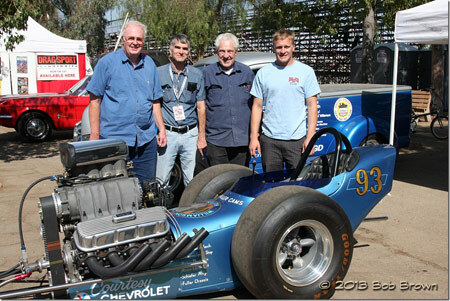 From left, Tim Love of LA, owner and driver of the Aussie 1940 Ford Ute in the background that served as the push vehicle. 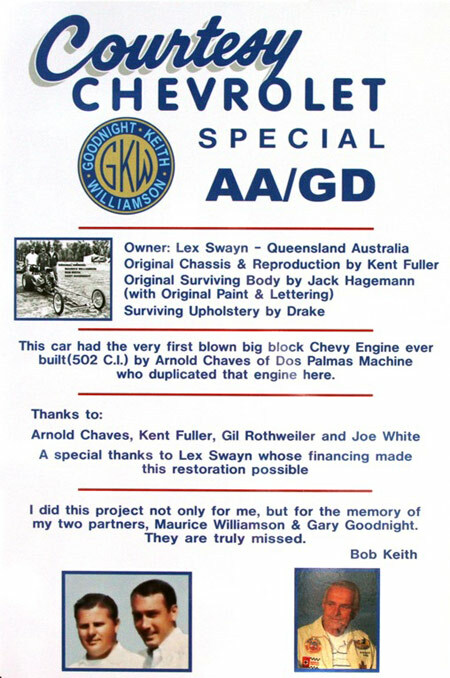 Next, Lex Swayn, Aussie owner of the car, then Gil & Terre Rothweiler. 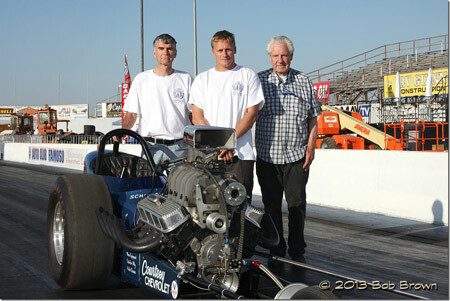 Lex Swayn (owner), Terre Rothweiler (driver), and Gil Rothweiler (crew chief). Left to right. Gil Rothweiler, Tim Love, Pat Schultz (Bob Keith's nephew), Greg Goodnight, (Steve's son) Terre Rothweiler, Steve Goodnight, Lex Swayn, Chris Goodnight, Randy Rothweiler (Terre's Dad), Elmer "Unsprung" Snyder (red shirt - a NorCal legend), Jamie Goodnight (Chris's Son), Joey Rothweiler (Gil's son), Jet Car Bob Smith in car. Lex Swayn on the left, with Steve and son Greg Goodnight. 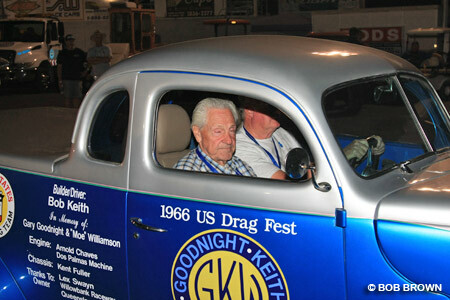 Terre Rothweiler drove the car in the Parade and Cacklefest. 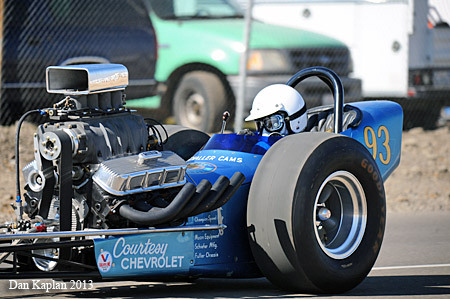 He's a pretty successful sprint car driver in the Bay Area. 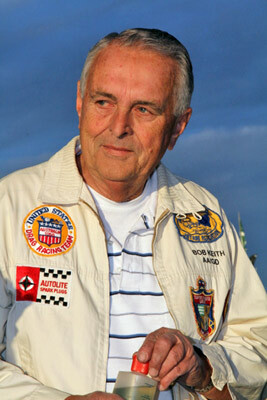 He is the grandson of Gil Rothweiler, a former racer from Turlock. 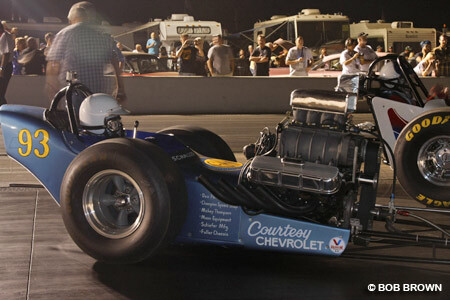 Over the weekend Terre gained a new appreciation of why his grandpa has been ga-ga over drag racing nearly all his life. 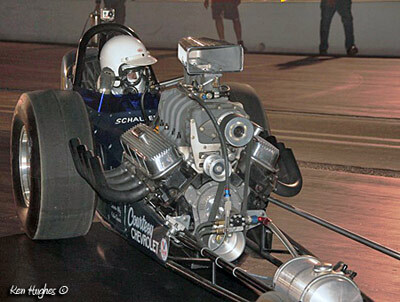 Gil was acting crew chief over the CHRR weekend. He also ran the cam grinding machinery for Bus Schaller back in the day, and still has the machines.